Sweet potato chews. Good, Mmmmm, Good. Ask Henry. 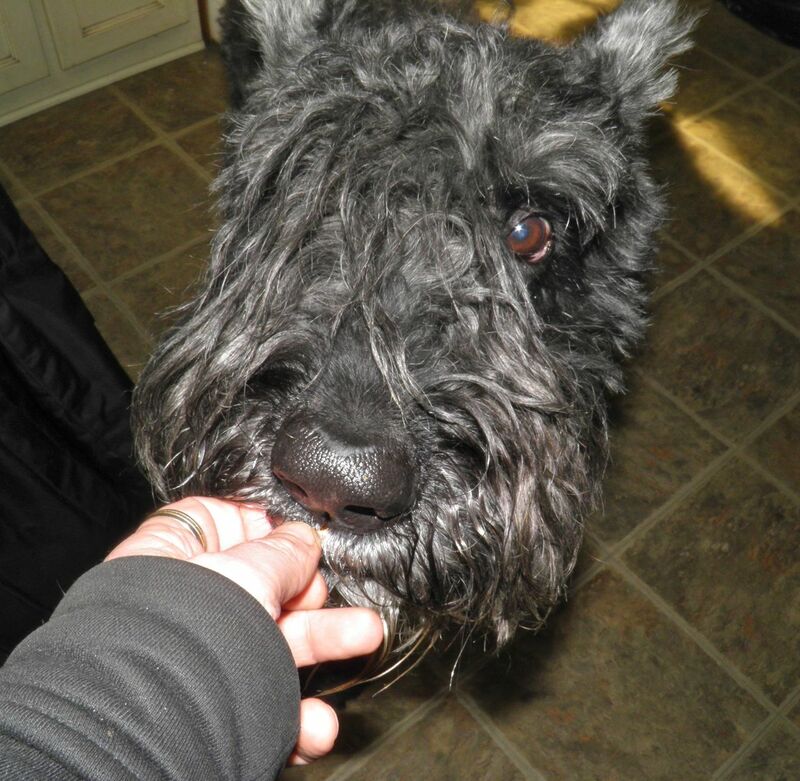 My dog Henry has discovered another favourite thing – Sweet Potato Chews. In case you’re unfamiliar with them, they are an all-natural dog treat marketed in Canada under several brand names. And they’re not cheap. But to make them yourself is. Making your own doesn’t just benefit your wallet. They're good for your pet too. No preservatives or unwanted fillers, no salt, grains, fats, etc. like many of what would be classified as affordable dog treats. These truly are all natural. The term “All Natural” is a bit of a craps shoot in the realm of dog food, and other pet foods in general. The same words should ring alarm bells in human food advertising whenever it appears as well. All natural. 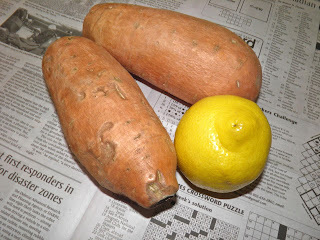 2 sweet potatoes, 1 lemon. That's it. “All Natural” is not regulated by the USFDA. That means a product can be labelled as “All Natural” without having to certify their product as having natural properties or having to be regulated by the Food and Drug Administration as containing natural products. So read your labels and ingredients lists. In Canada it will soon be up to consumers themselves to police human food labels as the Canadian Government is no longer going to do so. They have cut that responsibility in their latest budget. Can you believe it? Regardless, these treats are simple to make so no worries about labelling. Sweet potatoes, a lemon, an oven and time are all you need. How difficult is that? By making them yourself you are guaranteed there are no preservatives or other ingredients added to stabilize the treats. But make sure they are well dried. This vegetable ingredient (sweet potato) is commonly used as an acceptable filler source – one that normally doesn’t cause stomach upset or other digestion problems. Sweet potatoes have much more nutrition than regular potatoes. They're rich in antioxidants and anti-inflammatory nutrients, and are classified as an anti-diabetic food. They received this title because animal studies have found that sweet potatoes help stabilize blood sugar levels and lower insulin resistance. 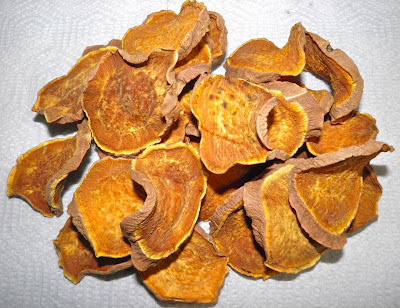 They contain vitamin A which also protects against emphysema. Soaking in lemon water helps preserve the colour. Notable Nutrients: Vitamin A, Vitamin C, Manganese, Copper, Fiber, Vitamin B6, Potassium, Iron. However, there are a few things to be cautious of when using sweet potatoes as an ingredient in your pet’s diet. A sweet potato is full of starch so weight gain is a possibility if too much is fed. Another thing to be wary of is that the skin of the sweet potato could contain harmful chemicals if mouldy. Be sure to inspect all sweet potatoes to prevent feeding a mouldy sweet potato to your dog and make sure to use them sparingly. But remember just because most vegetables are important in a dog’s diet, they are carnivores with omnivore abilities. That means they will eat (and their systems are able to digest foods) from many food groups, but their main requirement is meat. So regardless of your own food-based beliefs, never restrict your pet’s diet to reflect your own. They have no choice. You do. Always feed you furry loved ones a well balanced and healthy diet – one that is based on their species physiology. These are so good my fingers somehow get in his mouth too. 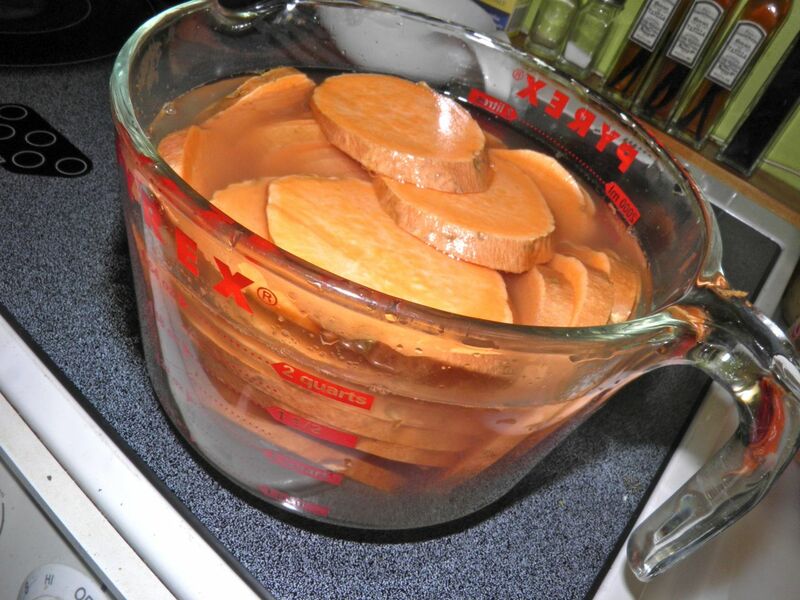 Wash the sweet potatoes well and dry. Do not peel. Slice the sweet potatoes into slightly less than 1/4” thick. Remember they will shrink in the oven. Place the slices in a bowl. Squeeze the lemon juice over the top and add just enough water to cover. This will help prevent discolouration when drying. Let the slices soak for about 5 minutes. Arrange the slices on wire racks or wire mesh (NOT cookie sheets) without touching. Wire mesh would be best. Place the slices in the oven. Set the heat to 220°F and let them dry for at least 3 hours. Check at that time and if not dry continue to bake until they are. It may take longer, depending on how thick you sliced your potatoes. If completely dry these will last for several weeks. Actually they won’t last that long if your dog knows where they are! Refrigerate any slices that may not be dried through to prevent mould and feed them first. * Robert Mueller is a registered pharmacist, author of “Living Enzymes: The World’s Best Kept Pet Food Secret”, and co-developer of BARF World’s BARF diets patties, nuggets and supplements – the first company to make the Biologically Appropriate Raw Foods (BARF) diet conveniently available to animals everywhere.